» Was Hudson Taylor wrong? 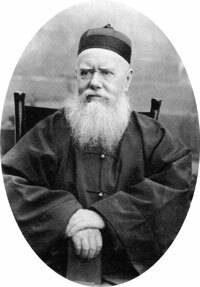 This quote from Hudson Taylor (1832-1905, missionary to China, founder of the China Inland Mission, now OMF International) is highly likely to be quoted in any discussion about raising funds for mission, and is usually used to trump any other argument. It is generally taken to mean that if you’re doing what God wants, the money will appear. But even worse than its overuse and misapplication is the fact that this striking quote is never challenged. It is given the status of a verse from the gospels. Hudson Taylor said it, so it must be true. But is it really true? It certainly doesn’t feel true to the many thousands of mission workers worldwide struggling to pay living expenses. So if we believe this verse, we are then forced to conclude that either we don’t have enough faith to believe God for his provision, or that we’re getting something wrong. This can inspire us to review our calling, our methods and our attitudes towards fundraising, or it can propel us into a spiral of self-doubt, lack of confidence and a crisis of faith leading to our unnecessary departure from the mission field. If our funding isn’t coming in, perhaps we do need to question our calling. When was the last time you sat down and really prayed over what God wants you to do with your life? When did you last discuss this seriously with your church or mission leadership? Are you conscious of a sense of calling to what you’re doing now? It’s also worth reviewing how much money you really need. Perhaps the funding is not coming in because our agency is asking us to live a Western-standard lifestyle where we could easily make do with less. For example, we may not have enough money to buy an air-conditioned 4×4 to get us through the Cairo traffic in comfort, but we may be able to pay for a bus ticket where we can share the journey with crowds of people we can start to build relationships with. But then of course we have to offset the stress of travel against our ability to survive in a foreign culture. What would Hudson Taylor do? In many circles today it is tantamount to heresy to question the aphorisms of the great Hudson Taylor. But despite his phenomenal role in the world of missions he was still a flawed human who made mistakes. Perhaps, as with many giants of the faith, he assumed that what applied to him in his relationship with God, also applied to others. There is no disputing that he had an incredible gift of faith to believe for and pray in God’s funding. But not all of us have that gift. It is good to be inspired to faith by his example, but not to be crushed by failing to live up to it. We should never forget that while God is theoretically able to provide for all our needs, he keeps all his money in other people’s pockets, which severely compromises his cashflow. If the people looking after his money are not obedient to him in emptying their pockets for world mission, many faithful mission workers may not experience the fullness of his provision. In the “fundraiser’s bible” it certainly sounds like heresy. However, I think there is still some truth to it, but it’s also true, as we know from the Bible, that God’s people forget that they are participants in God’s work and that one important way of participating is by giving to God’s work. That was Hudson Taylor’s experience, but I’m not about to call for your excommunication because, as you rightly point out HT’s words are not part of Scripture! Of course, the challenge remains that anyone carrying out God’s work is not an isolated being, but is part of the Body of Christ, so their work is also the responsibility of others who also need to be called to participate, by giving, prayer, joining or whatever is needed. The risk with a simplistic use of HT’s words is that someone might decide that they are doing God’s work, when they’re not because they are doing it alone, away from the Body and from accountability. I’d love to share this on the OMF Facebook page, I think it would go viral. After I found another job, they’d see how it benefited mission finances. Actually, I think you’d find a lot of agreement. Paul used different approaches in mobilising and encouraging support. Probably even used a little guilt and ‘competition’ – heaven forbid that we should make people feel bad about 2bn + unreached people. It’s not who you ask, it’s who you trust that counts. Seriously, I’d love to see OMF engaging with a discussion like this. I think there is more than one way of having faith in God. You beat me to everything. I don’t know why I bother! But what you wrote is very good, particularly in pointing out that God’s supply is much more than just the money. I’ve been blogging for a looong time, now. But sayings like this are so deeply ingrained in missionary mythology that there is plenty of room for critical engagement from various quarters. Thank you Tim for this very helpful piece of work! Especially in conjunction with Eddie Arthur’s blog post. Very helpful, encouraging and challenging for all who are either working in missions or preparing to. I really appreciate your work, Tim. I still remember the time we met in Rotterdam with great fondness. Keep up the good work, bro! Me too. It was good to spend time together. Hope we’ll manage it again some day. Hey Tim, cool and thanks! I am now Missionary myself, on the receiving end, and we had to build up a group of supporters in a few months; that included determining our own “policy” in asking for support (or not) etc. Can I bring your thoughts in a small article on Livenet.ch ? Please do! It would be great to help more people think about this. What are you doing now? And how is Regula?